In the 1880s, as elevator technology became more proficient, Toronto began experimenting with taller commercial buildings. Multi-floor structures, with elevators to connect the various floors, allowed greatly increased floor space and thus greater profits. These structures became possible because iron and steel were being employed to erect the frames of the buildings. However, the stone and brick exteriors were still sustained the weight of the walls, as opposed to using solely relying on the steel frame. In the 1890s, as technology improved, steel frames began supporting the entire weight of the walls, allowing for greater height without compromising the overall strength of the structure. This allowed true “skyscrapers” to be erected. When City Council voted to erect a new city hall at the top of Bay Street at Queen West, it was evident that taller buildings were in the future for upper Bay Street. There were already tall office buildings to the south of it at King Street, but the upper portion of Bay Street remained mostly low-rise commercial structures and frame cottages with stucco facades. The first of the taller buildings to be planned for this section of the street was the North American headquarters of the Independent Order of Foresters, a fraternal service club founded in 1874 to provided life insurance, savings accounts, and investment opportunities for families. Named the Temple Building, it was also was to contain club rooms for the members. The Temple Building was at 62-76 Richmond Street, on the northwest corner of Bay and Richmond Streets. A competition was held for the architectural contract, which was won by George W. Gouinlock (1861-1932). This was an important contract in the history of the city, as it was the first time that a Canadian had been hired to design all the stages of erecting a Toronto skyscraper. Gouinlock was born in Paris, Ontario and was educated in Winnipeg and Toronto. He was later to design the Press Building at the CNE in 1905, the Music Building in 1907, the Ontario Government Building (now the Medieval Times building) in 1926, and the Horticultural Building in 1927. All these structures remain on the CNE grounds today. The corner stone of the nine-storey Temple Building, with its cast-iron frame, was laid by the Governor General, the Earl of Aberdeen. The structure was completed in 1897, and for a year or so was the tallest building in the British Empire. Above the ninth floor there was an observation space, with a wide view of the downtown area. Created in the Romanesque Revival style, the building was similar in design to the City Hall to the north of it, which was completed in 1899 (today’s Old City Hall). The foundation walls supporting the Temple Building were over three feet thick, composed of stone and brick. Despite their immense size, it was the steel frame of the structures that supported it. It was devoid of architectural detail, other than over the two main doorways. The facades contained red bricks and Credit Valley sandstone. On the ninth floor, the walls were reduced in size to eighteen inches. The rectangular windows were recessed, which would have reduced the amount of sunlight entering the interior if Gouinlock had not created bay windows that captured extra light. It possessed heating and air-conditioning systems, marble fountains with taps that spouted iced water, mosaic floors, rich wood panelling, and fireproofing. The turrets on the corners above the ninth floor added to its appearance of Skyscraper height. In 1901, a tenth storey was added to the structure, but the original cornice was retained. In 1921, the firm of Shepard and Calvin was hired to make minor changes and upgrades to the building. The Foresters relocated in 1954 to larger premises on Jarvis Street, and then to a 22-storey building in Don Mills. However, as the 20th century progressed, Toronto rushed headlong into the future, fully entranced with the idea of out with the old and in with the new. The desire to create even higher buildings became overpowering. The last of the tenants of the magnificent Temple Building vacated the premises on June 29, 1970, and it was demolished later in the year. On the site of the Temple Building, a faceless 32-storey high-rise office building was erected, which contributed little to the streetscape. Its address was 390 Bay Street, and it was named the Thomson Building. I remember the Temple Building quite well, as in the 1940s when my parents visited Eatons at Queen and Yonge, we travelled on the Bay streetcars and alighted at Bay and Queen. We walked eastward to the Eaton store. As a young boy, I often glanced southward toward the building, as in my imagination it resembled the castles that I had seen in my picture books. Sources: urbantoronto.ca, heritagetoronto.org, torontoist.com, www.foresters.com, www.blogto.com, and “Lost Toronto” by William Dendy. View gazing south from Queen Street in 1928, from the steps of today’s Old City Hall. Toronto Archives, F 1244, Item 7361. View looking south on Bay Street from Queen Street in May 2013. The building on the right-hand side of the photo (in the foreground) is now on the site of the Temple Building. 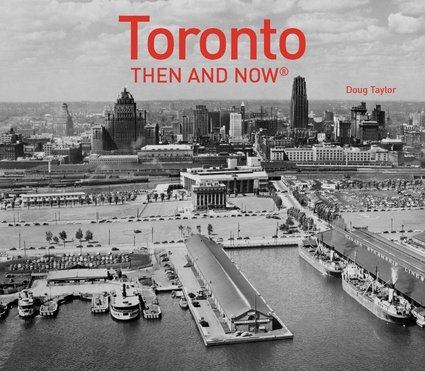 Another book, published by Dundurn Press, containing 80 of Toronto’s former movie theatres, is entitled, “Toronto’s Movie Theatres of Yesteryear—Brought Back to Thrill You Again.” It contains over 125 archival photographs and relates interesting anecdotes about these grand old theatres and their fascinating histories.